What is Cherwell IT Service Management? Cherwell IT Service Management upgrades your ITSM with streamlined and automated processes and tools that are easy-to-use and configure. Its feature-rich service desk conforms to eleven ITIL processes, even as it gives you flexibility to adapt to your unique workflows in HR, IT, operations and other units in your organization. Its service desk features a shared CMDB for integrated processes. Its other core features include Incident and Request Management, which consolidates tickets and requests for faster issue resolution; Change Management; Configuration Management, which helps you centralize items and associate data; and IT Asset Management for tracking and managing hardware/software assets. With these integrated features, Cherwell IT Service Management can help you design efficient workflows, oversee request with clarity and speed and adopt industry practices across your IT service and support areas. You also gain visibility, transparency and improve end-user satisfaction. The infrastructure is easy to set up as a SaaS solution or on-premise system. The vendor offers concurrent, inclusive licensing to help you manage costs. The platform can be extended via pre-built integration in the mApp Exchange, the community-driven app marketplace for Cherwell uses. Cherwell IT Service Management features integrated core features you’ll need to implement a more efficient service and support workflow. You can automate processes, monitor tasks and issues clearly and follow industry best practices. The result is increased efficiency of your IT team and productivity of your entire organization. A unified service desk system enables you to fulfill request faster and with more accuracy, associate related data for clarity and pinpoint bottlenecks or pending tickets. Tasks and requests are associated to specific persons in your organization across the service process, lending to them greater transparency. With drag-and-drop efficiency, you can configure dashboards, service portals, forms and workflows around what’s convenient for non-technical uses. Repetitive requests or issues can easily be resolved by users via self-service. Cherwell gives you the option to deploy the system via a SaaS subscription or on-premise setup. You can also choose from a variety of MSPs to host the system for your company. The vendor also claims you can switch from one model to another quickly whenever you require. The vendor offers shared, inclusive licensing so you don’t pay extra for additional portal users, password resets, automation and integrations. What Problems Will Cherwell IT Service Management Solve? Do you think your legacy service desk has become to difficult to maintain? Perhaps your current system is already outdated and can’t keep up with the changing needs of your company? With Cherwell, you can modernize your IT Service Management operations as well as the associated end-user experience using its fully customizable interface. It is also supported by flexible dashboards, user-friendly portals, and robust features and support capabilities to ensure that the platform will be able to cater to your needs even as your business’ needs evolve. If your IT processes are managed manually, there’s a high chance that you may be spending a lot of unnecessary time and effort on it. To cut down the hours spent on these tasks and to maximize the time of your staff members, you can standardize and automate your company’s IT processes using Cherwell. This application is designed to provide solutions that IT professionals and novice IT system users will be able to understand. In addition, they support one-step automation for a lot of processes so you can improve your customer service and overall operational efficiency without hassle. One of the most common problems of entrepreneurs is finding an ITSM software that will be able to provide you with all the tools you require for your operations. To resolve this issue, Cherwell designed their platform to have a coding-free architecture that allows users with no IT background to toggle with its settings. This way, you can configure the platform according to your needs without hiring a programmer to do it for you. The application also supports hundreds of integrations and third-party systems, so you can be sure that you will be able to use it alongside some of your favorite tools. There are well-liked and widely used solutions in each software category. But are they essentially the best fit for your organization’s specific needs? A trendy software solution may have thousands of subscribers, but does it offer what you require? For this reason, do not blindly spend on popular systems. 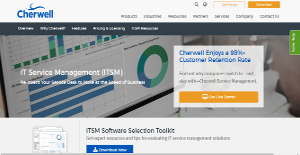 Read at least a few Cherwell IT Service Management reviews and mull over the elements that you wish to have in the software such as the price, main features, available integrations etc. Then, shortlist a few systems that fit your wants. Try out the free trials of these apps, read online opinions, get information from the seller, and do your investigation thoroughly. This in-depth research is certain to aid you select the most excellent software application for your company’s specific requirements. How Much Does Cherwell IT Service Management Cost? We realize that when you make a decision to buy IT Service Management Software it’s important not only to see how experts evaluate it in their reviews, but also to find out if the real people and companies that buy it are actually satisfied with the product. That’s why we’ve created our behavior-based Customer Satisfaction Algorithm™ that gathers customer reviews, comments and Cherwell IT Service Management reviews across a wide range of social media sites. The data is then presented in an easy to digest form showing how many people had positive and negative experience with Cherwell IT Service Management. With that information at hand you should be equipped to make an informed buying decision that you won’t regret. What are Cherwell IT Service Management pricing details? What integrations are available for Cherwell IT Service Management?